Litmus Theatre and Kabin combine to present the world premiere of Brave New World, Matthew Thomas Walker’s adaptation of Aldous Huxley’s 1932 novel of the same name. Huxley’s work is one of the earliest dystopian novels in English. In reading it one of the main interests is how many of Huxley’s predictions have come to pass – virtual reality, in vitro fertilization of humans, mood-altering medication, the dominance of entertainment over art. Walker’s stage adaptation is very faithful to the novel – faithful, in fact, to a fault. Huxley’s novel is a narrative, primarily descriptive and undramatic. Unfortunately, so is Walker’s adaptation. Act 1 of Walker’s play covers chapters 1 through 9 of the novel; Act 2 chapters 10 through 18. The action is set in the future in England in the year 632 After Ford (i.e., 2540ad), when England has been subsumed by a benevolent dictatorship known as the World State. The first act alternates its focus between Bernard Marx (Jesse Dwyer), an Alpha-Plus sleep-learning specialist and Helmholtz Watson (Adriano Sobretodo, Jr.), an Alpha Plus at the College of Emotional Engineering who has just been promoted to Head of Propaganda. As part of his elevation to a higher rank Watson is given an extensive overview by the Director of Hatcheries and Conditioning of how society has been carefully engineered to fulfil the two principal mottos of the State – “Community, Identity, Stability” and “Every one works for every one else”. Hatched from test tubes, people no longer have parents or families. Free love is encouraged and monogamy banned since marriage is seen as bottling up energy that could disrupt the stability of society. The people hatcheries engineer people to belong to fives castes from Alpha to Epsilon, each with a specific function in society. Hypnopaedia is used to imbed society’s rules into the unconscious and to make members of each caste happy at belonging to their caste. The euphoric drug soma has been invented for people to take whenever they feel any slight discomfort. All art except for the “feelies”, the successor to “movies”, has been banned and hatred of nature has been instilled. “decanted”, is a loner, although isolation is discouraged, and experiments with not taking soma to see if he feels more real. Meanwhile, Watson senses some force within himself, namely creativity, that has no outlet. It’s clear that in the present day he would be a writer, but in the future Watson has trouble defining what the longing is that he feels. The first act ends when Marx takes the nurse Lenina Crowne (Zoë Sweet) on a vacation to the pueblos of New Mexico. In that “savage” society outside the bounds of the World State, they come across a woman who used to live in London but was left behind. Marx brings her (Sophia Fabiilli) and her son John (Eli Ham) back with him. In Act 2 the focus shifts to John and his impressions of the perfect society of the World State. Predictably, he finds everything about it upsetting and he causes disturbances wherever he goes. Yet, Mustapha Mond, Resident World Controller of Western Europe (Nehassaiu deGannes), believes that it’s good for societies to experience controllable disturbances once in while since it makes them value their stability even more. As may be clear from this summary, although Marx and Watson may feel unhappy with their society, only Marx actively does anything to struggle against it and his struggle consists simply of not taking soma. The entire first half of the book, like the entire first half of the play, is undramatic because it consist almost entirely of exposition to explain the way that Huxley’s futuristic society works. In a novel exposition is simply part of narration and description itself can be interesting. On stage excessive exposition is tedious. We expect to learn about the world of the play though conflicts between characters rather than through reams of description. To make matters worse, the shift in focus from Marx and Watson as protagonists to John has less impact in the novel than it does on stage where we are used to investing our interest in certain figures. Besides this, since Huxley shows how an outsider reacts to all the same things that we had learned earlier about the World State from the Director and from the World Controller, the effect on stage is of having a repetition of an exposition that had already become tiresome the first time. John, however, is the first dramatic character to appear in the play since he is in active conflict with his society. These moments, especially when he exposes the secret of the Director in public, are those when the stage adaptation finally comes alive. Yet, even with John, many of his rebellions against his new environment are narrated rather than staged. last and the nature of the futuristic world is revealed primarily through action rather than description. To make Brave New World suit the stage would require a far more radical approach than Walker employs. Since John turns out to be the most important character and is in active conflict with the new world, a stage adaption could reasonably focus on him and the lives of the other characters could arise in the course of the action. That way we would also not have to go through a description of the new world twice. If Walker’s adaptation does not succeed because it is too faithful, his marvellously inventive direction does all it can to make the show as theatrical as possible. Walker has rearranged the seating in the Theatre Passe Muraille Mainspace, dividing it into two groups. One on the main floor sits at angle facing the north-west corner of the building. Another group on stage faces the west wall of the building. This works well because Walker uses the entire remaining space on the main floor, on the stage and on both the north and west walls of the theatre, not to mention the catwalk over our heads, as acting areas. This is the first time I have ever seen a production use so much of the the theatre for a show and use it to such great effect. Patrick Lavender’s set and wide-ranging modes of lighting, along with Nick Storring’s spooky sound design and unnerving music immerse us in Huxley’s alienating world more immediately than do Huxley’s words. Lavender cleverly uses to translucent screens on hinges on the stage-level north-west corner of the theatre sometimes to create a room, sometimes to suggests several rooms. In either case, he highlights the play of silhouettes against the screes just as he emphasizes the large shadows through by characters on the west wall of the theatre. great disappointment when his character falls in line with society on his return back from New Mexico. Sobretodo signals from the very beginning Watson’s ambivalence about his promotion. The more the Director shows Watson the secret workings of the World Sate, the more Sobretodo’s Watson becomes agitated, like Marx, without knowing quite why. Watson does finally understand the source of his disquiet, but we are again unhappy that it is overshadowed at the ending. 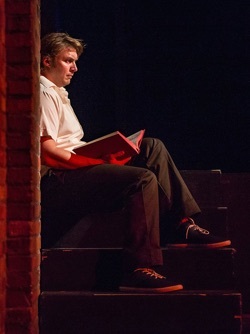 Eli Ham is excellent at portraying John, who is supposed to be a naive teenager. Ham makes perfectly believable the seeming incongruence of a boy grown up on an Indian reserve who uses Shakespeare’s works as a model for living. Shakespeare’s words seem to come as naturally to John’s tongue as would someone whose life has been infused by the Bible. The way Ham tells John’s story of his life in Act 1 is gripping and his increasingly disruptive behaviour in Act 2 point clearly to the unhappy fate in store for him. In complete contrast to these three distressed males, is the unnervingly calm presence of Nehassaiu deGannes as Mustapha Mond. Her soothing voice is rather like the voice of HAL the computer in the film 2001: A Space Odyssey (1968), a voice apparent unfazed by any disruption it encounters. DeGannes still makes clear that Mond is the supreme authority of the World State and exudes such self-confidence and self-possession that all the other characters appear foolishly frantic in comparison. Carlos González-Vio is well cast as an unquestioning Alpha-Plus male whose self-assurance seems at once both a strength because it corresponds with his character’s assigned caste and a weakness because, unlike Marx or Watson, he does not the question the world he is in. Zoë Sweet is effective as Lenina, a woman on the verge of seeing the flaws in her world but not bold enough to look too closely. Sophia Fabiilli makes Lenina’s friend Fanny come across as even more vacuous. As John’s mother Linda, however, Fabiilli gives us the unpleasant portrait of an outcast woman whose disruption of the World State is deadened by forcing her into a permanent soma holiday. For a world in which all emotions are suppressed, Ryan Hollyman tends to make his character of the Director appear too hotheaded and his later characters of the Arch-Songster too aggravated. As the folksy Deputy Sub-Bursar of the spa where Linda is held, Hollyman gets the tone just right of blissful unconcern no matter what the topic. Litmus Theatre and Kabin’s Brave New World is a brave attempt to bring a difficult novel to the stage. What Huxley’s novel forecast about the future is uncannily relevant today. As a director Walker succeeds in creating an immersive blissed-out world along with its disturbing undercurrents of the exploitation of human life and destruction of creativity. If only Walker could find a way to make that world more immediately dramatic it would have more impact. Stability may be one of the prime goals of the World State, but it is not one of the prime goals of theatre. That’s one of the reasons Plato banned it from his own utopia in The Republic. 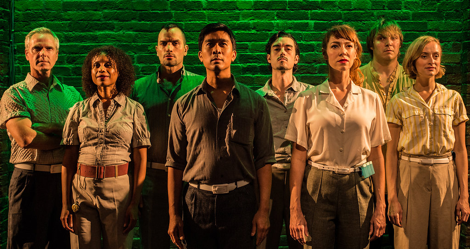 Photo: (from top) Ryan Hollyman, Nehassaiu deGannes, Carlos González-Vio, Adriano Sobretodo Jr., Jesse Dwyre, Zoë Sweet, Eli Ham and Sophia Fabiilli; Jesse Dwyre as Bernard Marx; Adriano Sobretodo Jr. as Helmholtz Watson; Eli Ham as John. ©2016 Dahlia Katz.